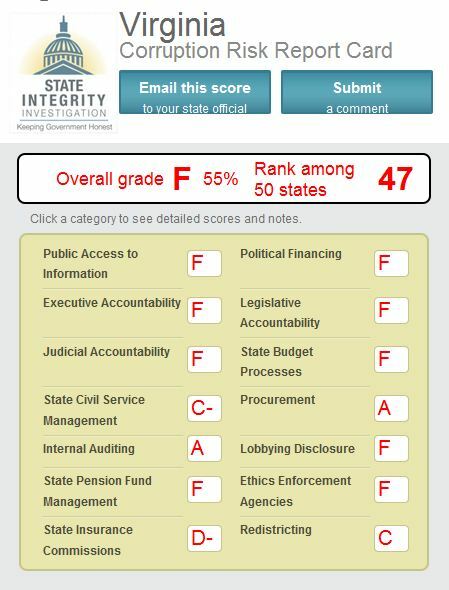 Virginia lacks the systems necessary to ensure that corruption doesn’t happen, so much so that it could occur and not even be detected. An audit report on internal control usually includes language about how fraud can occur and not be detected. But that doesn’t mean companies don’t implement internal controls, which is the equivalent of what Virginia has done. So yes, I think the F is well deserved. One thing I didn’t mention in my column was the “C” Virginia received on redistricting, a score I found surprising. Looking at the details, Virginia got credit for holding the public hearings, even though they didn’t listen to the speakers! An open and transparent process where the end result is already guaranteed is not worthy of a “C” in my opinion. * – In case you were unaware, my column appears in the paper each week, on Wednesday. Next Post Have we as a nation lost our civility? I thought your comments on this in the paper were right on point. This is so sad. I agree they should not have scored that high if they were basing part of the grade on the redistricting. They ignored what the public speakers said and they would not even have one meeting with the Senate and House as they could not work together. It was just a show to say they did something. Its sort of like getting a C for showing up for class even if you are playing video games through the whole class .